Oopsie, wrong spot. Meant to send a PM. Would it be ok to forward a PM i got? No previous posts, at first I thought she was promoting a breeder. Then I got the impression this one was condeming me for taking in a rescue. I know i'm sensitive about losing Lexi, but come on. Let me know if I can forward to you or another member. Their screen name is Minor. where can I purchase one of your coats? I tried looking on Etsy, but I didn't see anything listed for sale? I sew a bit, and have made a couple of horse blanket type coats, but I really love the yours. I like the high collar, and it would be perfect for overnight hikes. It gets cold in the mountains at night even in July or August. Hi, I am thinking my boy Jackson needs a new sweater and have seen the pictures here of your work. do you have a website? Hey meadowcat, wrote back to you recently and I know your busy with family stuff but even a shor response would be much appreciated. Rockman - I replied to you via a private message. I'd be happy to chat with you about breeders, and even talk in person/let you meet my boy if you are local. 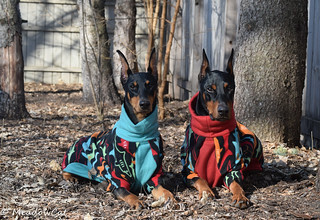 Hey there Mrs. Meadowcat, I've always been a fan of your dog Jammies and thought I'd offer to help you create a site to sell your cute apparel from if you ever need one. Feel free to send me a message if you're interested! 09:57 PM - gamermouse0213 mentioned MeadowCat in post Posting Adventures Begin! 01:16 PM - gamermouse0213 mentioned MeadowCat in post Posting Adventures Begin! 07:49 PM - gamermouse0213 mentioned MeadowCat in post Questions, Questions! 08:39 PM - gamermouse0213 mentioned MeadowCat in post Questions, Questions! 10:35 AM - jesseq mentioned MeadowCat in post Obedience- how harsh is too harsh? 10:10 AM - MeadowCat quoted dobebug in post The Girls Outside! 10:10 AM - MeadowCat quoted ECIN in post The Girls Outside! 01:40 PM - MeadowCat quoted ECIN in post The Girls Outside!